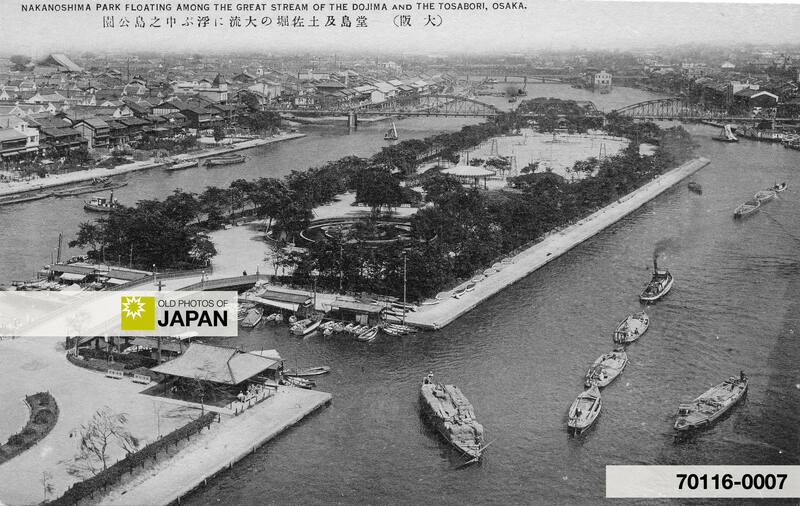 Opened in 1891 (Meiji 24), Nakanoshima Park was Osaka’s very first public park. It was built on Nakanoshima, a small stretch of land that divides the old Yodo River into the Dojima River and the Tosabori River. During the Edo Period the banks of these two rivers were lined with Kurayashiki, the warehouses and residences of samurai who sold goods from their domains in Osaka. But by the end of the 19th century, the area was quickly shedding its Edo face and Nakanoshima became the focus of Osaka’s modernization. On the side of the island not shown in this photograph, one after the other Western style building rose from the ground. The Neo-Renaissance Osaka branch of the Bank of Japan was built here in 1903 (Meiji 36). The building was designed by Kingo Tatsuno, famous for his design of Tokyo Station. The Neo-Baroque Prefectural Library was constructed on the island in 1904 (Meiji 37). It was built with a donation from the Sumitomo family. In 1918 (Taisho 7), the Central Public Hall was completed right behind the library. The funds for this Western building were also donated. By Einosuke Iwamoto (1877-1916), who had made a fortune in the stock market during the Russo-Japanese War (1904-1905). Shortly after he donated the money, he lost his fortune and committed suicide. 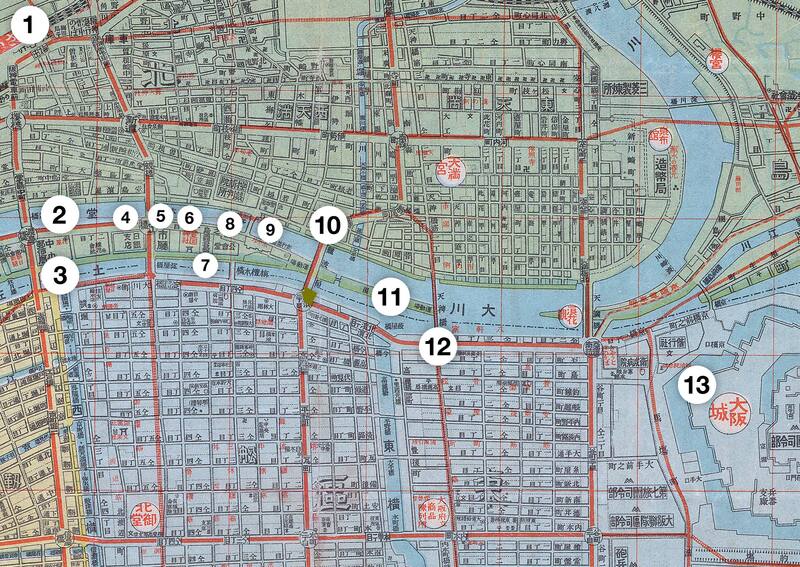 Nakanoshima also became the home of Osaka’s brand new City Hall, built between 1918 (Taisho 7) and 1921 (Taisho 10). 1 Metadata database of Japanese old photographs in Bakumatsu-Meiji Period, Osaka Hotel. Retrieved on 2008-04-07. 2 The Asahi Shimbun. Osaka Nakanoshima New Buildings Project. Retrieved on 2008-04-07. You can also licence this image online: 70116-0007 @ MeijiShowa.com.